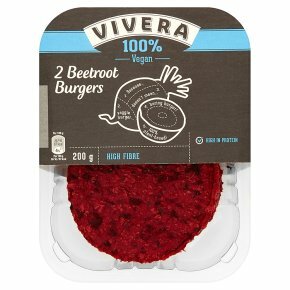 Burger made from beetroot and soya protein and seasoned with spices. High in protein and fibre. 100% vegan.Your convenient plant based alternatives: 100% Vegan 100% Tasty 1. Because... 2. veggie burger... 3. doesn't mean... 4. boring burger! 5. 100% plant-based! Heat for approx. 8 minutes in a pre-heated oven at 225°C. Turn over half way. Fry in 1 x tablespoon of hot vegetable oil for approx. 4-5 minutes on a medium heat.